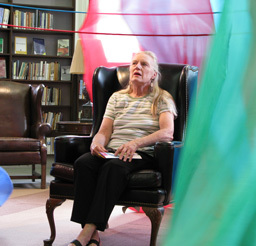 Shelter comprises two rotating concentric silk ‘tents’ suspended over a reading chair. 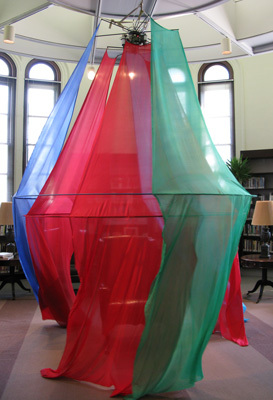 The two tents move independently through a choreographed dance of twisting and spinning, all in response to changes in the light and human presence. 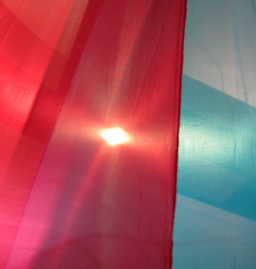 The bottom panels of the structure are low and flutter in the air as the tents rotate; visitors should feel welcome to step under them and sit to experience the piece at close proximity, touching the fabric and seeing the interplay of the light, fabric and motion. 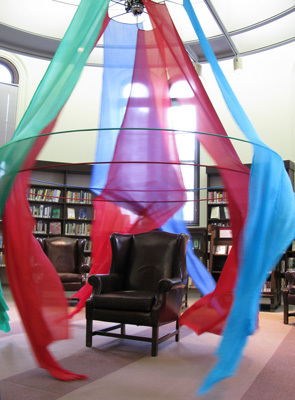 The installation ran July 9-29, 2008 in Pittsburgh, PA, installed in the International Poetry and Quiet Reading Room on the second floor of the Carnegie Library Main building. 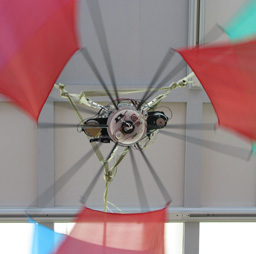 The piece was commissioned by Robot 250 and appeared as part of the BigBot show distributed across the city.